If you like Japanese manga and anime, then you will know that Osamu Tezuka, the “God of manga”, was one of the early pioneers of this exciting Japanese art form. Astro Boy, perhaps his most well known manga has been hugely popular in Japan since its inception in 1952 and often cited as the character that bought manga and anime to the mainstream. It is so popular that Astro Boy was even made into a computer animated Hollywood film in 2009! Sadler’s Wells Theatre in London are presenting a brand new production running from the 6th to 10th September inspired by Osamu Tezuka that explores his fascinating world – a blend of tradition, science fiction and contemporary reality. Japan Centre have a pair of tickets for one lucky winner to go and see the show, so you too can be inspired by this master artist and his work! Visionary Japanese manga artist and animator Osamu Tezuka provides the inspiration for internationally renowned choreographer and Sadler’s Wells Associate Artist Sidi Larbi Cherkaoui’s brand new work – TeZukA. Using the dancers’ movements to trace the physical evolution of Tezuka’s drawings – from a line on a blank page to a single Japanese kanji to a fully-formed manga character – Cherkaoui will bring the “God of Manga’s” philosophy, drawings and characters to life. 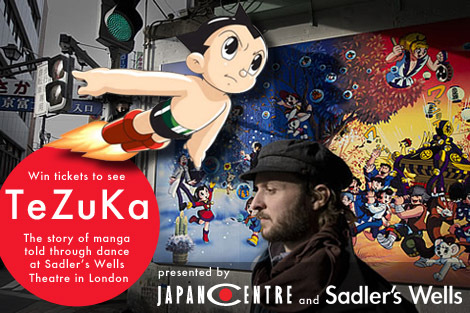 This competition is for a chance to win a pair of tickets to see “TeZuKa”, a brand new music and dance performance at the Sadler’s Wells Theatre in London. The performance is showing between Tuesday 6th September and Saturday 10th September 2011 and we have a pair of tickets for the opening night on Tuesday 6th September 2011 to give away. This competition is open to everyone who follows Japan Centre through our social media channels! It is running on both Facebook and Twitter, so choose your social media platform of choice and head over to our Facebook page and leave a comment on the competition post or enter the competition by following our Japan Centre Twitter feed and re-tweeting the competition tweet! We will choose a random winner from everyone who leaves a comment on facebook or re-tweets on Friday 26th August and let you know over the weekend if you have been chosen. Please make sure that you are in London and available on one of the dates that this performance is showing before you enter. Gambatte everyone and don’t forget to keep any eye out for our next competition… coming to Japan Centre again soon! Even if you aren’t the lucky winner this time, I really recommend checking this performance out as it looks amazing! We even have another little offer so that you can get the maximum enjoyment from this show. Simply bring your TeZuKa programme with you to Toku Restaurant and we will give you a free glass of Umeshu plum wine when you order your meal. Posted in Uncategorized and tagged Anime, competition, manga, theatre. Bookmark the permalink.